Out of bread, I walk down the street only to find the IGA grocer unexpectedly yet to open. So I’m loitering in the gloom, reading Paddy Grindlay’s story of last night and his Tigers. It’s early Sunday morning after a late night. With numbing fingers, I’ve read Timothy Boyle’s thought-provoking Sunday Age piece on writing, on sportswriting, and I’m standing in the cold and thinking again of the false bravado shown by the eternally outraged. The look-at-me of the pourers of scorn. So indignant, so certain. Some of them are even paid for their bile. On we go. Just after midday and we’re onto the train at Northcote; a train snaking through the dawning winter of Melbourne’s northern suburbs. This is Collingwood country, populated historically by Collingwood people. It is no surprise to open the sliding doors on a black and white carriage. Members of the Collingwood army chat, laugh. Wizened faces streaked with lives of coulda-woulda-shoulda Collingwood moments. Young ones bedecked in black and the whitest of white, expecting; hopes aflame. This is our first trip to the footy in 2017. Buds wearing the scarves knitted by granny. Clutching woollen bears (Pendles and Swanny) also made by granny; dancing the bears along the hand rails. Anthropomorphising these bears (“Look, Swanny, there’s the Merri Creek”). So many people with a connection to this place. And through that, to the footy club. For many more, probably the reverse is now true. “Hey, your family never lived here, did they? In the contrived marketing blitz that is an AFL season, this Round 10 is Sir Doug Nicholls Indigenous round. And of all the themed carry-on, I think this one is done well. Recognition, as a first step, seems to be growing. A quiet education. There is so much here. So much. Room for better, sure. And room also to celebrate how far we’ve come. The footy starts. We’re here. 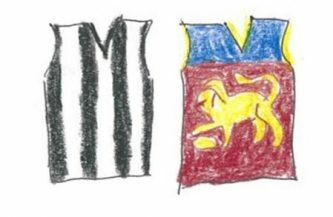 Thinking of Collingwood v Fitzroy fixtures when I was the buds’ age, on a cold winter’s day with 30,000 at Victoria Park, I remember that a clamour would build ahead of the opening siren. An expectancy. Voices would holler. “Go you Magpies! !” Eyes, attention would fix upon the various match-ups. “Big day for you, Daics!” Pre-game murmurs would build to a crescendo; a ripple approaching the shallows of the shoreline; an inevitable swelling, a rising, an explosion of possibility. Anticipation pregnant. Until: BAAAAARRRRRRRRRRP. Today a roaring audio visual distraction entertains the seated masses. Until abruptly a game starts. Some begin to watch, some stick with the outlet of their smartphones. Or the Footy Record. It’s a scrappy opening. A couple of opportunistic Brisbane goals to some rangy kids. I love the skinny arms of the new recruits. In contrast, D Beams and S Pendlebury now each carry comically enhanced biceps. Proportions of their bodies look wrong. Nevertheless, in D Wells, J Elliott and B Grundy, Collingwood have the three classiest players on the field. And S Pendlebury. That’s four. D Wells, in number 67, is the band leader, the conductor. New to the club this year, I wonder about his off-field presence. Who is he to these other players? With every passage of play, he improves the team situation. He’s on rhythm guitar. As forecast, icy rain soon arrives and with it a biting, cold wind. Through falling curtains of cascading rain, still the creativity of D Wells dominates the play. Dry weather footy comes unstuck, as short handballs slip through fingers. Conditions suit now a wolfish player; a player of staccato bursts of instinct, with the stamina and smarts to run a long distance race of attrition. And that is J Elliott; today disguised as a skunk, having presumably lost a bet. As is common, today he leaps, leads, contests, scrambles, tackles, chases, collects, dives, doubles-back, feints, marks, kicks, knocks, zips and blurs the lines between man and blue heeler. Along with D Wells, J Elliott is making this day. The rain sprinkles down. And Brisbane work back into the game. And what game is this, anyway? Certainly it is a game unrecognisable from the game played at the old Victoria Park. Every player is inside the Brisbane 50 metre line. Every one! The game is less about one-on-one match-ups and really an extended game of keepings off: 18-on-18. With a perpetual imperative to create a loose man; an overlap. Chips, short passes, backwards, sideways. It is hard to know when to cheer. Previously, cheers would punctuate contested marks at half forward, or the wing. Maybe a tackle. Nowadays, there is not much incidental cheering during play. A rolling maul of keepings off offers not much punctuation of excitement. Perhaps there are more exciting things happening online. S Pendlebury to A Fasolo and Collingwood goal, to the sound of bemused puzzlement. To the sound of 32,750 people in bemused puzzlement. Another goal to Brisbane, lowly Brisbane. Taylor Adams gets up from the bottom a pack again, scattering seagulls. And Collingwood have the win. The black and white army leave the scene of battle; of keepings-off. I like the dash of this 2017 Collingwood. The persistence, today. The blue heelers. What is truly different about these guys to the Dogs of 2016? What prevents these guys from winning a flag? It seems a matter of finding ways to win keepings-off. Doing it together. Being together. In 30 years the game has changed. In 30 years societal attitudes have changed. We walk up the eastern hill of Yarra Park; navigating impatient men behind steering wheels. We walk over, past the cars, on the crest of the hill. 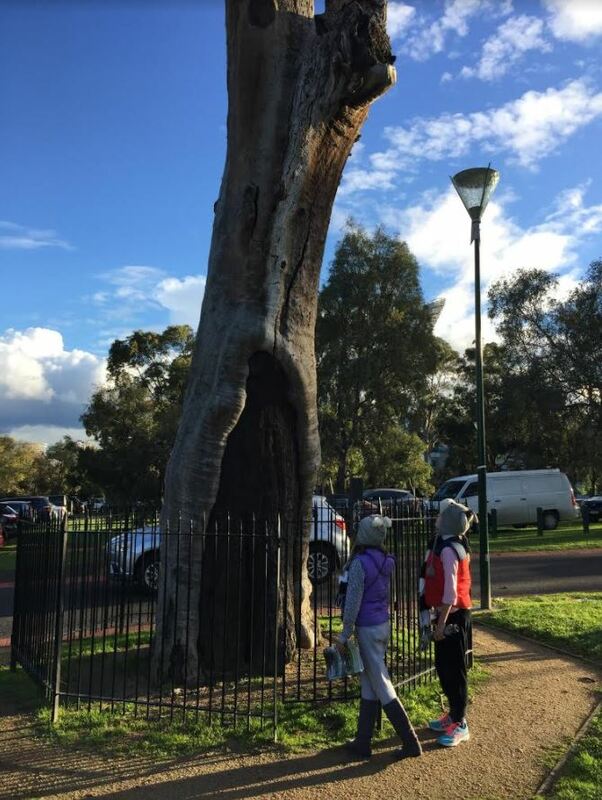 “The scar on this River Red Gum tree was created when the Wurundjeri people removed bark to make canoes, shields, food and water containers, baby carriers or other items. I think of those changes I’ve seen in footy; changes in societal attitudes. And think of the colossal changes seen by this tree. We stand at the fence, talking about living history (“that tree – that tree right here. Dad, imagine if trees could talk. Imagine all the stories; of all the things that have changed.”) We talk of D Wells in #67 and a realisation of past wrongs. It is the perfect end to the day. David- enjoyed your yarn and extra points for the Transvision Vamp reference- not nearly enough of these on the FA’s fine pages. “the contrived marketing blitz” – yes, but footy and people and places are in front. Just. You’ve got me looking forward to Collingwood at the MCG in late June! Greek Orthodox Christians have a habit of crossing themselves whenever they pass an Orthodox church. My brother and I used to do it whenever we went past Victoria Park, much to our mum’s chagrin. “At least we believe in something.” we’d tell her. J.Elliott makes footy worth watching. 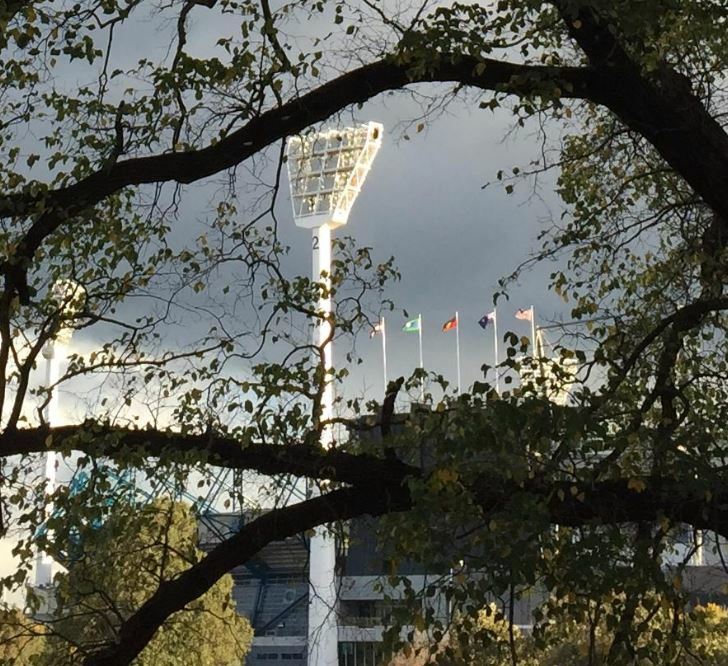 Beautiful photograph of the MCG through the trees and with the flags. Yes, it is the round formerly known as the Indigenous Round. And now it has been fine tuned to be the Sir Doug Nicholls Round who played an important role in the campaign of 1967. Much of Sir Doug’s early (?) campaigning was done at footy games. My impression is that the AFL has had a fair amount of input from the Nicholls family in terms of naming the round after him and how best to acknowledge his role. Gill also had one of the press conferences in front of the statues of Sir Doug and Lady Nicholls. During the Saturday night game, a number of people in the crowd around me talked loudly and chatted while the ceremonies took place. I felt they could have been a little more respectful, but this is a footy crowd, and we all bring our own ways of socialising and engaging to the game. Beautiful time by the tree with the buds. Thanks for Dads like you. Mickey – a colleague also picked out the Transvision Vamp reference today. When I told him of a poster I once had on my teenage wall, he nominated the exact picture. Striking. Phil – the connection to place now sadly lost for the Melbourne clubs. J Elliott, indeed. So much to like. Andy – terrific clarification. Thank you. Edits have been made to the text above. I think progress is being made around awareness of indigenous Australia. It’s my impression. Though there will always be exceptions to the rule. OBP – B Grundy would have to be in the mix. He’s a beauty (and getting better). MdeH – I wonder what the next evolution in footy will bring; how it will come about. Maybe a rule around interchange. Maybe a coaching idea. I guess playing for raised stakes heightens any footy experience. Perhaps this was a merely a game between two lowly sides playing out as expected. Our time at the Scarred Tree was as lovely as it looks. 32,750 would have been sensational at Victoria Park. I often look with envy with what Geelong now have at Kardinia Park and wish we’d gone down a similar path. “The great philosopher Wendy James and Transvision Vamp”, as an early teen was a massive fan of Wendy’s philosophy as well as her other attributes! I’m with you on Victoria Park. A home is such a significant thing. A place. So many homeless clubs now. A mate yesterday (hi DM) picked exactly which poster of Wendy James I had on my teenage wall. I’m still yet to obtain a poster of Socrates. Wells on rhythm guitar. Yes. Watching him, I, too, have the sense of an intruder. Maybe it’s the late start to the year, in a new jumper. A bit like how the mid-season recruits used to sometimes seem. I was interested to read your observations about the level of crowd involvement and the lack of punctuation in today’s game. I’ll be in Melbourne in a few weeks time to see my first games since 2010 (when we still had exclamation points in Didak, Leon and a youthful Daisy), so I’ll be curious to witness firsthand the delights of the rolling maul and what the crowd distinguishes as it’s finer points. ‘Moments’ of the game, as well as crowd involvement are somewhat central to my haiku. So weeks like these can be a bit of a struggle. Inspiration must be drawn from elsewhere, not such a foreign concept to the sports writer, I suppose. ER – what a magnificent tree that is. Imagine how magnificent it was. Some years back we went to the imaginatively named “Big Tree” in the Huon Valley in Tasmania. It was like standing at the base of a living cathedral. Old trees, really old trees, capture all my imagination. Like the line about Elliot losing a bet. Didn’t Shane Woewodin have a hair-do like that? I occasionally pass Victoria Park on my way to the city venues. I do have a soft spot for it as it was a great place to watch a match and if you came away with a victory, you knew it had been earned. I even played there once in under age competition – naturally finding myself on the losing side. Phil and the other Vic Pk afficionados would like a reminiscence which I seem to associate with Stephen Downes, more recently a noted foodie, but once a general journalist. He recounted the tale of his grandfather who also intoned as the train from Ivanhoe passed Vic Park “Consecrated ground, boys”. Downes also referred to that famous (or infamous, depending on your prejudice) 1958 Grand Final. In the week prior, grandfather had promised to buy the family a tv if the Magpies managed the improbable on the coming Saturday, and then had to make good his undertaking. Such observations ER. A delight to read. Like others, I love the train past Vic Park. (How good is that Magpie – like it was put there especially for The Club, only it was the other way around). A key to theSouth Morang line is that the track is elevated, and surprisingly high. Past the Carringbush. You look across Richmond and Collingwood to Abbotsford, across the roof tops. The terrace houses. The stories. The punting. The boozing. Grim and great all at once. I especially like it when, God forbid, you have to get that dawn train to get somewhere for who knows what, and the sun is rising over Raheen, like Archbishop Mannix is bending over to do up his shoes. The very action of you writing this ER is an antidote to Tim Boyle’s concerns. If you haven’t read Tim Boyle’s piece I encourage you to. But read it with the Almanac in mind and then give a thought to why it has been important (at least to me) to keep this site going. What he is yearning is actually provided by this site, just without the incumbent audience. The question is how much fight do we have to keep this going, a question which might need to be answered fairly soon. Writers write. It’s even better if they know they’re lobbing their carefully chosen words towards open-hearted readers. We know we have that here. Hi Dave. It’s the Red Boxes from Eltham. Loved it, thanks. ER- I resisted reading this because I couldn’t imagine inspiration coming out of Collingwood v Brisbane. You defied expectation. Harmsy – that’s Richard Pratt’s arse shining out of the windows at Raheen. The sacred and the profane – pick your poison. Serious Suggestion – Time to put an Honour Board of subscribers down the side of the Home Page. The Footy Almanac is brought to you by ……………………… Name and Shame. A Badge of Honour and a constant reminder. My cheque is in the mail. Beautiful work Tall Man, just execeptional…..
E Reg, there’s a real generosity of spirit about your writing. This is yet another example. But I must confess to feeling a bit out of step with what seems to be a developing consensus at the site re the playing and observing of the play this season. I think the best of what I’ve observed this season is as good as any play I’ve seen in all the time I’ve watched the game. The split second choreography of teams in tight situations working to free themselves. The unbelievable displays of individual skill that so often seem taken for granted. The subtleties and sophistication of so much that is going on off the ball. I could go on…. That’s the best. Of the worst, well, that’s much like the worst of any era. It’s just that the packaging and presentation is much more ostentatious now. But as sophisticated consumers, surely we should be able to look past the packaging to the content. I saw parts of this game. It was no gem. But I’d rather watch J Elliot or S Pendlebury even on an average day than most of the other entertainment options we have generally available. I suppose everyone makes their own choices about that which they seek. This was most enjoyable and relaxing reading for me, e.r. Although I appreciate the historical and romantic links Collingwood people have to Victoria Park, I despised the place with a passion; it does not hold great memories for me. Whatever happened to that great philosopher Wendy James? Thanks ER, a really good read framing a game that I had little interest in. Very pleased to hear D Wells is playing influential footy and ‘rhythm guitar’ is such a great way of expressing that. Wendy James and the lass from the Electric Pandas were probably my two biggest Countdown turn-ons. Wendy put out an album last year according to Wikipedia so she’s still dishing out the philosophy. I visited Vic Park for the first time quite recently, and as a Tiger was delighted but bemused to see that thanks to OH&S the colour scheme in the stands is now yellow and black. Great piece, I loved everything about it. J Butler – No doubting the skill, courage and effort of footballers today. A game, though, may appear dominated, stifled by coaches and strategies; minimising risk. Maybe that was happening on Sunday. Maybe it was just difficult in the cold and wet – though that doesn’t explain all 36 players being inside Brisbane’s 50 metre line. But equally, another game may be a carnival of free-flowing enterprise and speculation. All part of the tapestry, I guess. Beauty is in the eye of the beholder, perhaps. What a great read regnans . Victoria Park was the only footy ground we had to stay close to Mum and Dad and Nana and Aunty Gwen, when the Dons were playing there.